Last August we rolled out Google Apps at my school. It is getting used in some really creative ways, but because we are not yet one to one, users are not logging in often enough to remember their passwords. So we get a lot of help desk calls to reset passwords. I know it is not the most secure, but to keep it simple, we have a default password that we always use when we reset. To do this in the control panel, you have to browse for the user, then type in the new password twice. Doing this often gets old. So I wrote a simple script where all you have to do is type in the user name. (This is the email address without the domain.) Next a confirmation screen displays the user's first and last name. One final click and the password is reset to your predetermined default password. Set up is fairly simple, you can just copy and paste the code from below into a Google Apps Script File, or click here to create your own copy by selecting File -> Make a Copy. 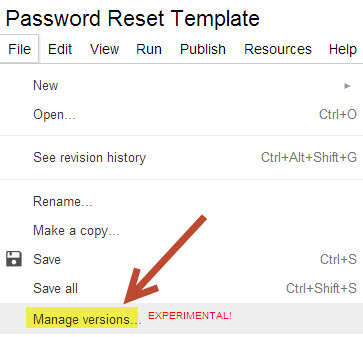 Once you have the Google Apps Script file open, the first step is to change the default password. Go to line 104 and change the red text inside the quotes to your default reset password. Next you will have to deploy it as a web app. To do that click File -> Manage Versions. Then just click save new version. (You don't have to type anything in the box.) 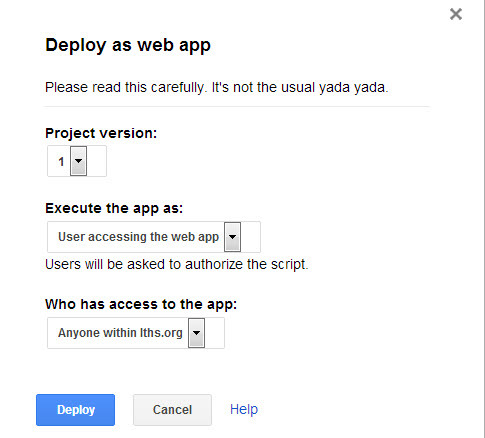 Now click Publish -> Deploy as web app. Now the web app is deployed. Use the link that pops up to share it. The final step is to control which users have access to this script. You do this by granting access to the provisioning API in the Google Apps Control Panel. To do this you will need super admin rights to the control panel. Within this role, scroll down to the bottom and look for the Provisioning API's section. Click users. (This should automatically check the 4 columns to the right.) Click save changes. Finally, assign admins to this role. They will have to authorize the scrip the first time they use it. Excellent article.I am very happy to see this type article .I am also trying to write this type article with the help of custom essay writing services guidelines.I am eagerly waiting for your new stuff. We have some good suggestions to reset password by using Google App. The author explained it in a good manner and the screenshots pass the idea quickly. It helps the users to catch the procedures.